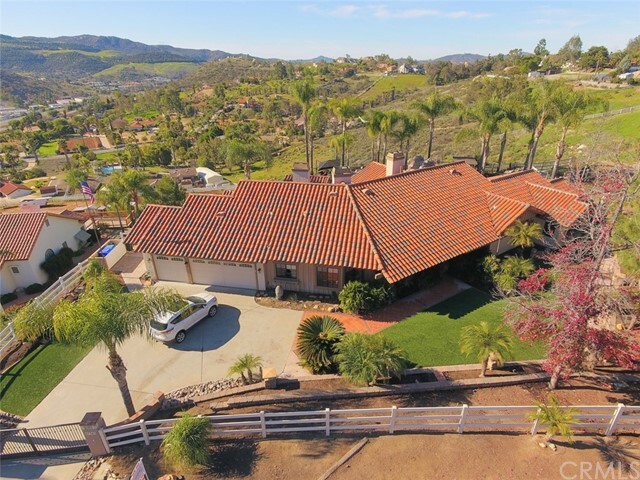 All El Cajon homes currently listed for sale in El Cajon as of 04/18/2019 are shown below. You can change the search criteria at any time by pressing the 'Change Search' button below. "$995,000-$1,145,000. Sprawling Single Story Estate Boasts Privacy & Serenity Offering Ultimate Relaxation & Seamless Indoor/Outdoor Living. Enter Through Bold Wright Iron Front Doors Into Exquisite Craftsmanship, Unexpected Lines & Brilliant Architectural Design That Maximize Luxurious Living. Rich Details Throughout Include Hardwood/Travertine Flooring, Impressive Stone Fireplace, Artistic Accent Lighting & Immaculate Master Retreat. Grounds Feature Mountain Views, Pool/Spa, Family Orchard & OWNED SOLAR! Neighborhoods: HORIZON HILLS Equipment: Garage Door Opener,Pool/Spa/Equipment Other Fees: 0 Sewer: Septic Installed Topography: LL,GSL"
"Spectacular value in gorgeous Blossom Valley. Gated 2 acres estate with open mountain & valley views. Entertainers delight with zero edge pool and plenty of room for multiple cars. Light & bright open 2 story design with palatial ceilings, hardwood floors, custom arched entry door. 3 fireplaces with stone accents. Stunning kitchen with all the bells & whistles! Beautiful landscape & hardscape, SOLAR OWNED! Hurry, this one won't last! Neighborhoods: Blossom Valley Architectural Style: Custom Built View: Custom Built Other Fees: 0 Sewer: Septic Installed Topography: LL,GSL"
"Bring all of your toys to this 19 acre single story estate, with panoramic views. Features: 5 bedroom, 4 bathroom, 3 car garage, Granite counters and bath, stainless steel appliances, vaulted ceiling, dual furnaces with heatilator, rooftop solar, and custom windows. The lot features several pads and roads, with RV storage. Fruit trees, gardens, quartz,Horse facilities including a training ring and many trails. Privacy in the hills of Crest. Price reduced to recent appraisal value!!!! Motivated Seller! Neighborhoods: Crest Architectural Style: Custom Built View: Custom Built Other Fees: 0 Sewer: Septic Installed Topography: LL,"